Some Conservative backbenchers have said they do not believe Theresa May will be able to fight the next general election as prime minister. Their comments follow Mrs May's claim she was "here for the long term". Labour said she was "deluding herself" - but Foreign Secretary Boris Johnson led her defence, insisting she could win an absolute majority. However, ex-Conservative Party chairman Grant Shapps said it was "too early to be talking about going on and on". Having had "conversations with 50 or so colleagues" in the run-up to the summer, Mr Shapps said: "The truth is we ran a very poor election and you can't just brush that under the table and pretend it didn't happen - not least because we went from having a workable majority to no majority at all, so that stands to reason." He added that while there was no mood for a leadership election, Mrs May's remarks "will certainly raise some eyebrows". "Let's get some performance, let's get some delivery for the British people and then let's see where we are, rather than vice versa," Mr Shapps told BBC Radio 4's Today programme. The former Tory Chancellor, George Osborne, who became a newspaper editor after being sacked by Mrs May, compared her premiership to the "Living Dead in a second-rate horror film". The former education secretary Nicky Morgan told BBC's Hardtalk it would be "difficult" for Mrs May to lead the party into the next election, due in 2022. But former Conservative leader Lord Howard told BBC Radio 4's World at One that she "should stay on". "I think she was quite right to say what she said today. She has quite rightly said there's a job to be done. I think the government is back on track." And Graham Brady, the chairman of the 1922 Committee of backbench Tory MPs told Sky News that the parliamentary Conservative party was not concerned with "the leadership question". "We certainly want the prime minister to get on serving the national interest doing that job for our country. We don't want people distracted," he said. Theresa May didn't set off to the Far East to deliver a message that she would "go on and on". But have her interviews changed the facts on the ground? While some MPs were swiftly deployed to make clear she can indeed stay on, from my soundings the former party chairman Grant Shapps and former Number 10 communications chief Katie Perrior are nearer the mark. The former told the BBC her performance would be assessed post-Brexit, while the latter - admitting that Theresa May could have said little else in response to questions about her future - believes she still won't lead the party into the next election. 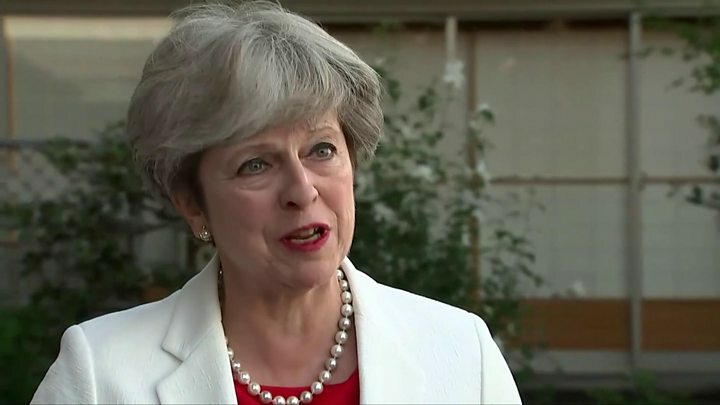 Debate over Mrs May's long-term ambitions was sparked after she told the BBC's Ben Wright in Kyoto that it was her intention to lead her party into another general election, whenever that was. "Yes, I'm here for the long term. What me and my government are about is not just delivering on Brexit but delivering a brighter future for the UK," she said. Mrs May said she wanted to ensure "global Britain" could take its trading place in the world, as well as dealing with "those injustices domestically that we need to do to ensure that strong, more global, but also fairer Britain for the future". Emphasising her stance on Thursday, she told reporters: "I said I wasn't a quitter. There's a long-term job to do, there's an important job to be done in the UK. Yes, that's partly about Brexit and getting Brexit right, but if you think back to what I said when I became prime minister, when I stood in Downing Street, there are many other issues that we need to address." The prime minister has been under pressure after losing her Commons majority in a snap election called earlier this year. Some reports had suggested she could stand down in 2019 after EU withdrawal. But speaking on a visit to Nigeria, Mr Johnson, who received public backing from Mrs May after recent criticism of his performance, said: "I've made it clear I'm giving my undivided backing to Theresa May. "We need to get Brexit done. "She's ideally placed to deliver a great outcome for our country and then deliver what we all want to see, which is this exciting agenda of global Britain. "I think she gets it. She really wants to deliver it. I'm here to support her." The UK is due to leave the EU in March 2019 and supporters of Mrs May have said leadership speculation serves only to undermine attempts to secure the best possible terms of exit. Shadow Cabinet Office minister Jon Trickett said the prime minister was "deluding herself" about her plan to stay in power until the next election. "Neither the public nor Tory MPs believe her fantasy of staying on till 2022," he said. "Theresa May leads a zombie government." Katie Perrior, former director of communications at Downing Street, said while she also did not believe Mrs May would fight the next general election as Conservative leader, the PM could not have answered any differently in the "middle of Brexit negotiations". The next general election is not scheduled to take place until May 2022, by which point Mrs May - if she stayed in Downing Street - would have been prime minister for nearly six years. In the immediate aftermath of her party's failure to win June's general election outright, several MPs called on her to consider her position. The prime minister has sought to consolidate her position by negotiating a governing agreement with the Democratic Unionists and overhauling the way Downing Street works, replacing key advisers. On the second day of her trip to Japan, Mrs May will hold official talks with her counterpart Shinzo Abe and emphasise the growing security links between the two countries.